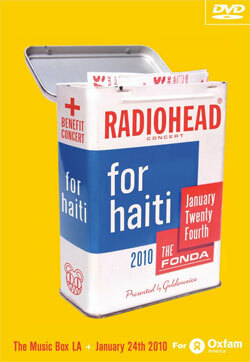 Radiohead, a British band that made waves by offering its latest studio album for free or "pay what you want", has just endorsed a community-made DVD of its Haiti earthquake charity concert from January 2010. The DVD is downloadable for free via BitTorrent, and you are strongly encouraged to donate as much as you can to Oxfam's Haiti Earthquake and Recovery Fund. Creation of the video was a labor of love; video footage from 14 cameras has been used, and you can choose from four different audio tracks, all recorded by different people. Three Radiohead fans, inez, formengr and andrea, have spent the last year collecting the various sources and compiling them into the definitive video of the concert, and boy have they done a good job. For more details, check inez's blog (but be warned, there is liberal use of fuchsia and aqua), and if you don't fancy an 8GB download, a full-resolution version is also available to watch on YouTube (watch it after the break). If you like it, don't forget to donate! Thanks for sharing this post to us and i appreciate the way you work for this blog. Every Type of Beer: "How Best To Get Drunk"